Zap lice, not kids. Zap, a popular head lice treatment formula contains no insecticides. Contrary to products containing insecticides, Zap has a mechanical mode of action. Zap gets into the respiratory orifices of lice who die from asphyxia and dehydration. 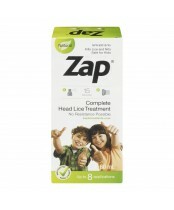 Due to this new mode of action, lice cannot become resistant to Zap; Zap head lice away with Zap!